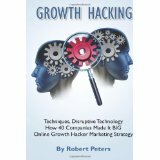 This is my second book on growth hacking (go me!) and I’m feeling like my understanding of this subject has definitely improved. What this book did well was the examples – loads of them. I thought there would be much more ‘explanation’ in the book. There isn’t. It’s really one chapter on the mindset and then the rest is all examples. It’s also quite short. I read 50% of it in a lunch-break. This might be a bonus for you until you realise that the price tag is still similar to other longer books ($10 on kindle). Those two minor-moans aside, I really did enjoy all the case studies of strategies that ‘real’ companies have implemented. The key themes for me across the companies were; sharing, referrals, building the marketing into the product design and making it exclusive e.g. beta invites. p.s. if you like this growth hacking stuff then the other book I have read is Ryan Holiday’s Growth Hacker Marketing, he uses similar examples to this book (hotmail, AirBnb) but has a bit more explanation as to how the craze (or term) came about.